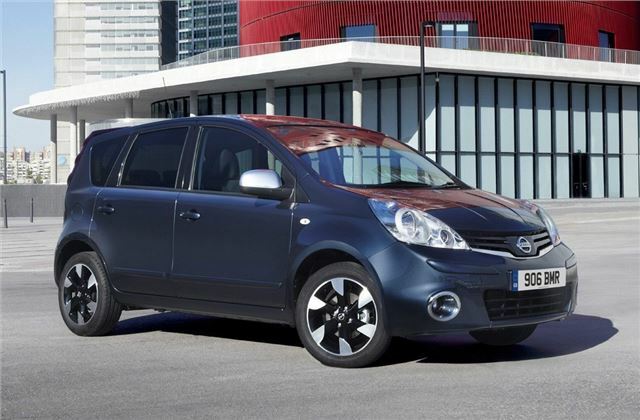 Hold onto your hats because Nissan has updated the Note for 2012 with some new alloy wheels on Acenta models, chrome fog light surrounds and a new seat fabric with blue stitching. The new diamond cut two tone 16-inch alloys replace the 15-inch wheels on the current Acenta trim models which also get climate control, automatic headlights and rain-sensitive wipers as standard. The best-selling N-TEC has been upgraded too with rear parking sensors while rear privacy glass and a touchscreen sat nav are also included. The ‘Connect’ sat nav system also features an iPod connection, USB port and Bluetooth. Prices start at £11,200 for the Visia, with the new Acenta at £13,000 and the new N-TEC+ a further £500. The engine line-up continues with the 1.4-litre, 1.6-litre petrol and 1.5dCi power units. The Pure Drive badged 1.5dCi emits 110g/km of CO2 with a combined economy figure of 67.3mpg. The first of the new Notes will reach dealers in early February.